The Annual Rib Cook-Off is Coming! 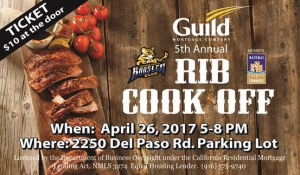 This April 26th fundraiser is a fun community event – Guild Mortgage’s Annual Rib Cook Off. All proceeds generate funds for Inderkum High School athletic and music programs. PLEASE NOTE: Rib Cook Off dinner tickets are sold out. However, admission to the event is free so if you were unable to get a ticket feel free to come and listen to music and purchase, ice cream, beer, wine, and raffle tickets.